1. Interest rates are at all time record lows. The time to purchase a home, and make money is when interest rates are high and falling. I discussed this topic last week in detail in Rising Rates: Simple Economics. If Fannie and Freddie continue to be the dumping grounds for close to 100% of new mortgages, it will take years for the market to correct downward to free market levels. 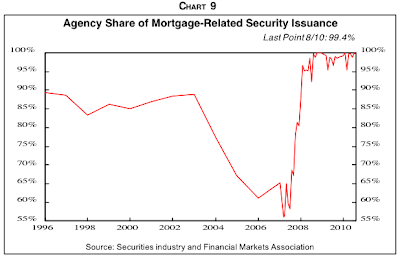 If Congress should have to cut the Federal Budget, and they feel that paying for Fannie and Freddie losses are less important than food stamps, unemployment insurance, social security, or medicare (the four pillars keeping our society on the other side of the thin line representing mass social unrest) then housing prices will collapse. 3. 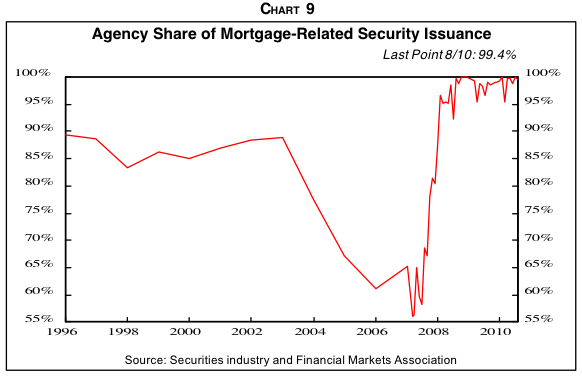 There is currently close to 40+ months of total inventory in the market, most of which is the now famous "shadow" inventory, which are homes that are bank owned but being held off the market to avoid losses. As this inventory (which grows every month as prices fall and the unemployment numbers worsen) begins to make its way onto the market it will put tremendous pressure on prices to the downside. 4. 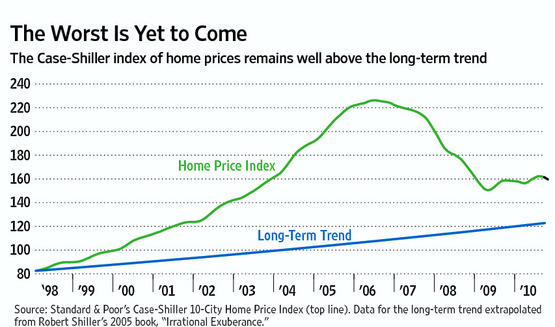 Home prices need to correct downward about another 35% to reach their long term growth chart line of 3.5% per year. Usually markets over correct to the downside, which would have already happened had the government not interfered with the free market forces. There will be an opportunity to buy real estate at very cheap prices. But that time is not now entering 2011.